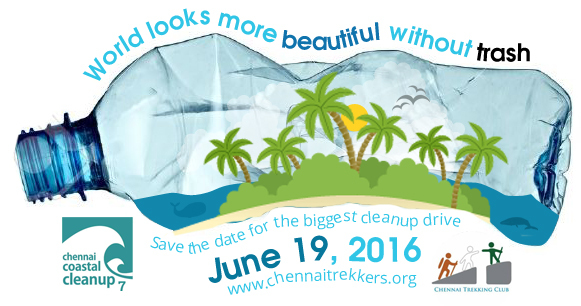 Chennai Coastal Cleanup 7 – Developments so far !!! 943 volunteers (Individuals + Volunteers across 14 various organizations) have signed up so far to participate in the 7th edition of Chennai Coastal Cleanup and various other awareness activities associated with. buy siemens nx 11 C HENNAI is rising, once again. Various Corporates / Social Groups / NGO’s and socially responsible individuals are joining hands together to reclaim the beauty of our Singara Chennai’s beaches/lakes. Also they are about to get involved in various other activities which can help reduce the per-capita garbage that is generated in our daily life, garbage which are generally thrown out and dumped in the corporation dumpyards. Dont be left behind. Enlist yourselves soon. Sponsors / Partners needed !!! We are looking out for sponsors in various categories, including title sponsor, for this edition of CCC. If you or your organization is interested to become the title sponsor for CCC7 or to sponsor in one more categories please register here. More details on sponsorship can be found here. CCC7 Brochure can be found here. Most of the registered individuals / organizations have not just signed up for the one day cleanup on June 19. They have actively came forward to take part in several of the initiatives listed below, which were started as part of this year Chennai Coastal Cleanup. 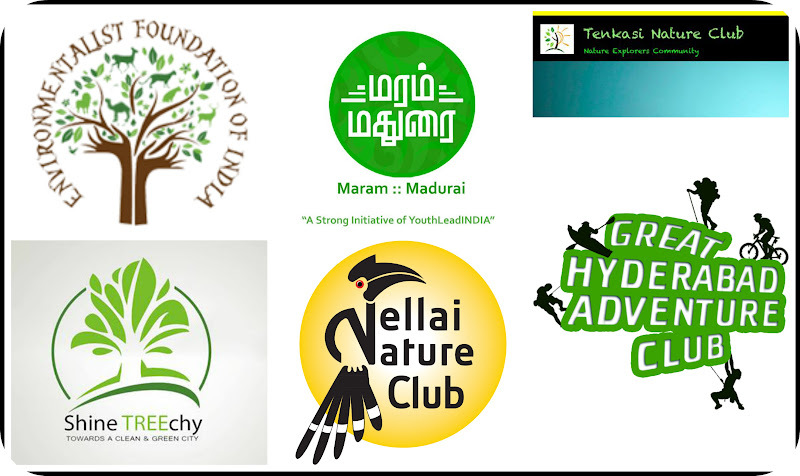 Various organizations have came forward to help us implement several initiatives in their workplace, which includes NoPlasticChallenge, Regular Cleanups in Chennai, Tree plantation and sapling maintenance activities, Waste management, etc. Dont be left behind in the race to sustainable living, be it your home or workplace. Register heresoon. Every weekend our lead volunteers are engaged in assessing the cleanup zones and also engaging the local community wherever possible. Below is a summary of volunteers requirement estimate based on the survey done till now. 7 environmental groups across 7 cities have signed up with us so far to participate in this edition of India Clean Sweep. 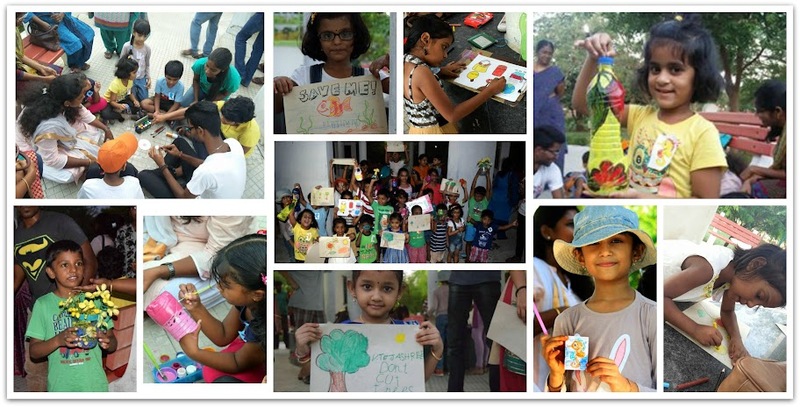 India Clean Sweep is a nation wide cleanup event organized by CTC alongside the annual Chennai Coastal Cleanup. #NoPlasticChallenge which was a huge success during CCC6 has been started this year too and our volunteers have already started pitching in with their simple but effective ideas to reduce the usage of single-use plastics in their daily life. Typical things include not using straws, using cloth bags, used pet bottles, etc. Few volunteers have taken #NoPlasticChallenge to the next level and are educating our next generation to not only avoid these single use disposable items but also how one can effectively reuse our daily household items into something which can replace these single use plastics. What are you waiting for ? Get started with your #NoPlasticChallenge. More details on how to get started, rules about #NoPlasticChallenge and some tips to avoid plastics in our daily life can be foundhere. 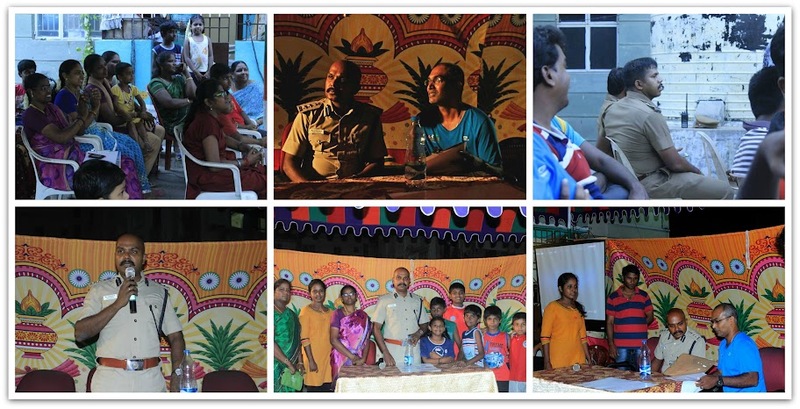 ‘Kuppai Illa Kudiyiruppugal’ – Every weekend our CCC7 team along with volunteers from CESAW are conducting awareness sessions in various apartments & residential areas across the city. The motto of these event is to effectively spread awareness about Garbage Overload, the imminent threat that any metro city is facing now, and how segregation at the basic level can help us effectively handle this problem. In the past 2 weeks our volunteers have been conducting this event in residential areas across various parts of the city. Nochikuppam Housing Board, Kotturpuram Police Quarters, Injambakkam residential area to name a few. The aim of this event is to try and educate home makers, kids and others on how segregation works and how simple it is to do. How something which will take only few minutes of our daily time can effectively reduce the garbage that we throw out of our house down by atleast 70%. 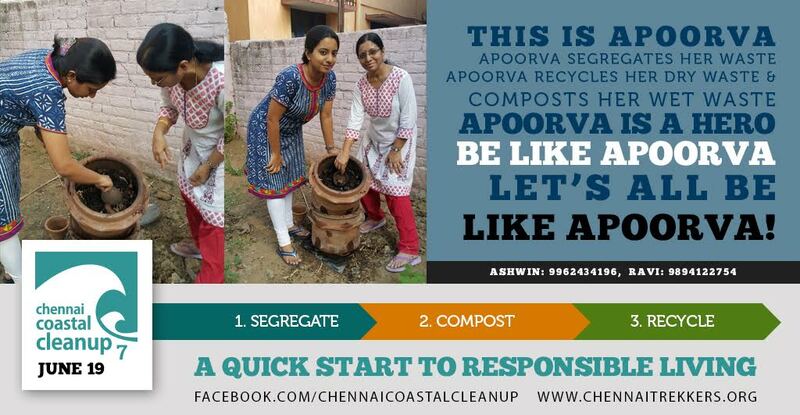 Leading by example, few of our CTC volunteers have already taken up the challenge of implementing segregation and composting in their home and have successfully been doing them. Read their 50 days of success story here !!!. Are you interested to implement Source segregation and Composting in your Home / Apartment / Office ??? Submit your details here, our volunteers will get in touch with you. Complete details on segregation and how easy it is do can be found here !!! 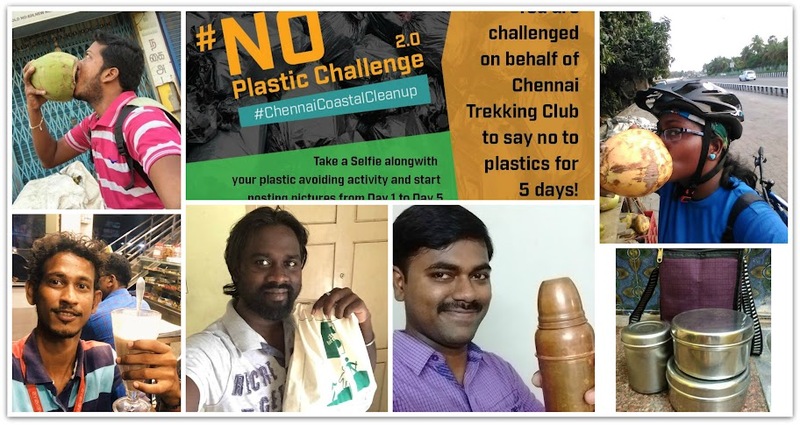 An article has been published in Adyar Times about the many different initiatives that Team CCC is currently doing – both in field and online – to create awareness on growing impact of garbage / plastics on the environment and health and how to transform to sustainable lifestyle. With the main focus of the article on the inauguration event to kick start segregation in houses of Kotturpuram Police Quarters – ‘Kuppai Illa Kudiyiruppugal’ . Whenever we conduct an awareness or fun event for kids, its us who take a lesson or two from the kids of current generation. Our volunteers have been conducting events in Kotturpuram Tree Park and few other places (apartments & residential areas) to spread awareness about the need to stop using plastic items in our daily life. 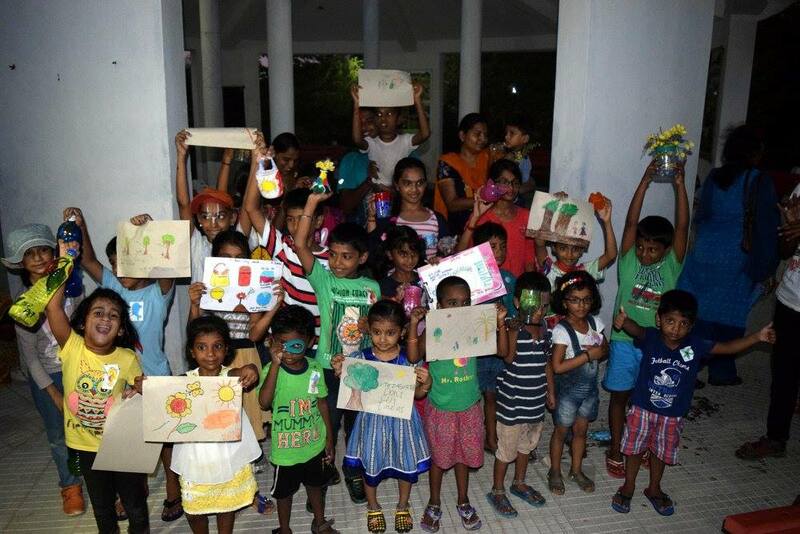 What was planned as a simple drawing competition turned out to be a surprise for us, where the kids started making craft items from plastic household items that were thrown. Leading by example, Shri. V. Balakrishnan, IPS, Deputy Commissioner of Police, Mylapore has proactively came forward to help us in implementing our segregation ideas in residential areas and other places. He has promised to lend all the help that we need in successfully putting our plan into action. As a first step it was planned to implement segregation in the police quarters of kotturpuram. Mr. Balakrishnan himself inaugarated the CCC7 campaign in kotturpuram police quarters last week. There are more plans to implement in partnership with the police department in coming weeks. Watch out our FB page for more regular updates. 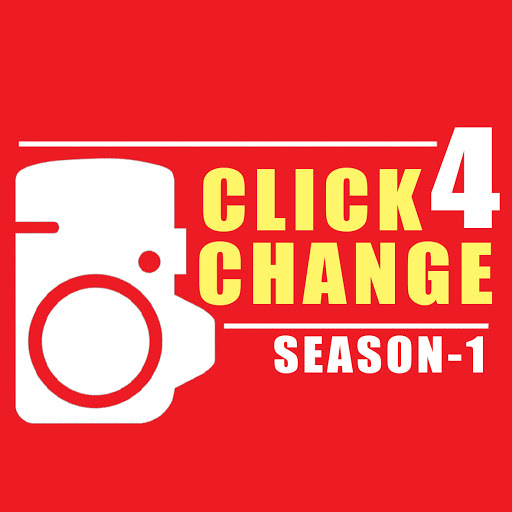 As part of an initiative associated with the annual Chennai Coastal Cleanup 7 (CCC7), Chennai Trekking Club has launched an online photography contest for all the shutterbugs out there. Interested to showcase your photography skills and also effectively educate the world about the ill effects of plastics and garbage overload ??? Go through the complete details here to know how to submit your entries. More details and rules about the event can be found here !!! Entries selected for the contest can be found in this album. As a vibrant group of outdoor enthusiasts who have understood the importance of eco-friendly living and who is pained continously witnessing the “Garbage Overload”, we are intending to use the powerful tool of Running to spread awareness. If you are interested to run along with fellow CTC volunteers register here. Running event will happen across Chennai on various days. Complete schedule will be shared with registered participants. 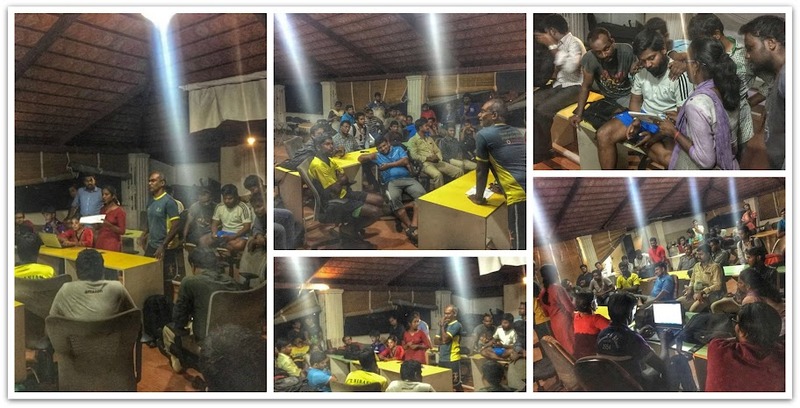 Our lead volunteers meet every wednesday evening @ Thiruvanmiyur to discuss the progress on all the CCC7 activities and the way forward. Got the leadership skill in you ??? Want to lead the way for your friends / colleagues / neighbors ??? Write to us if you are interested to become one among the lead volunteers. You dont have to step out on the field to help us promote awareness, you can do support and promote us on social media through any of the below means. Update your FB Profile pic with this CCC7 image !!! Update your FB Cover with this CCC7 Cover !!! Update mail signature with this beautiful poster !!! Like, share and promote our CCC7 FB Page !!! Join the CCC7 events which will be created on our CCC7 page. Share and invite your friends too !!! 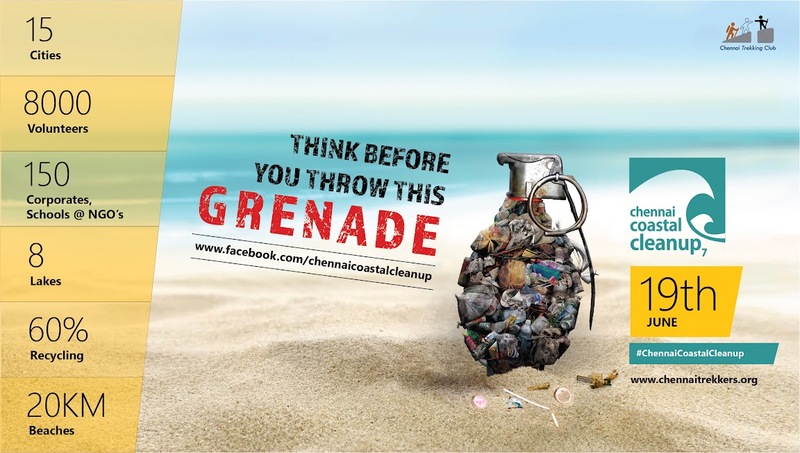 Also use the hashtags #ChennaiCoastalCleanup #GarbageOverload #CCC7 in your posts.